Thousands of water garden ponds and streams have been built in the last few years. What was once reserved for an elite few is now being enjoyed by people everywhere. Homeowners are realizing the beauty of backyard ponds, small water gardens and goldfish ponds and even streams and are transforming their lawns into private sanctuaries. You can too. Both large and small backyard ponds add beauty while attracting birds and other wildlife. The gentle sound of flowing water has long been observed to have a great calming effect. Modern water garden ponds come in a variety of shapes, sizes, and styles ranging from very small and simple to large and ornate. Small ponds can sit on the patio or even attach to the wall. Larger ones can be built above or into the ground. You can build a pond from a kit or design one from scratch. Stones, grass or lush gardens can surround your water garden project depending on your personal tastes and budget. Add lights, torches, an arbor or a pergola for added enjoyment. 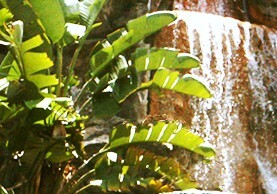 These days it is very popular to add a feature such as a waterfall or fountain. Your pond can contain fish and water plants. You will discover that fish have their own personalities and will soon recognize you. There are even pondless waterfalls and pondless streams. Water flows down and is pumped back to the top in a continual cycle. The choices are endless. All it takes is a little imagination. However, ponds are not maintenance free. Like anything else, to look their best they must be maintained. Most areas of pond maintenance do not require a lot of work and many people find maintaining their pond quite enjoyable. Once you learn what must be done, depending on the size of the pond, most things take only a few minutes. Rest assured that every pond owner must do the same things to maintain the water, filter, plants and fish. Over the years, many time saving tricks and techniques have been developed to make the experience more enjoyable. We will share those with you here. If you have ever considered adding a backyard pond or stream then you will find this section extremely valuable. You will find everything you need to make a decision and help getting started. If you already have a pond we offer top quality products to keep your pond looking great.